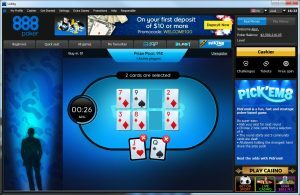 We have become accustomed to PokerStars introducing new types of poker games, but sometime in the near future, 888poker will be launching its own novelty game called Pick’em8. It is not a “real” poker game, but rather a casino game using poker as a vehicle. 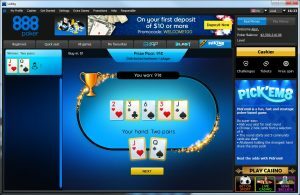 Though Pick’em8 has yet to hit the 888poker lobby, there is a landing page for the game on 888’s website. What is interesting when you load the page is that some text describing the game briefly flashes on the screen before the words “Coming Soon” replace it. Fortunately for the two of you who are reading this (Hi, Mom and Dad! 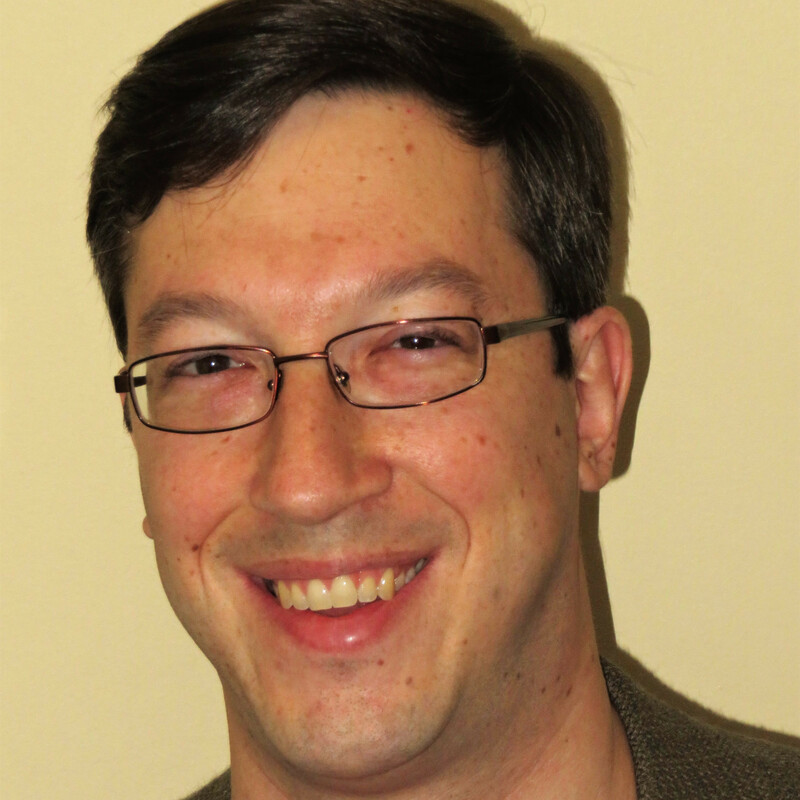 )* I am a stable internet genius and did a little sleuthing to uncover the rules of the game. Since that text flashed for a moment, I figured it had to be on the page somewhere, so all it took was opening the debugger in my web browser to look at the webpage’s code. Anyone can do this at home with tools built into any browser, so I’m really not all that special (in regard to this, specifically – I’m quite special in other ways). It’s all right there, if you have the patience to do a lot of scrolling. In Pickem’8, players compete primarily against the house, though there is some indirect competition with each other. As 888’s description says, there are “no direct opponents,” a concept we will hit on a bit later. And this is most definitely true. Each round looks like it could go very quickly, depending on how much time 888 gives players to make decisions. I am guessing that it will take as much as “a few minutes” because rounds won’t necessarily start immediately after one ends, but will rather be timed so as to give players a chance to enter. When players join a game of Pick’em8, they are presented with eight possible hole cards, all face-up. They have a limited amount of time to select two of these as their pocket cards. Players who do not lock in their selections before the time is up will have the two cards that they have highlighted chosen for them. If no cards have even been clicked on, 888 will automatically pick two. The rest of the Pick’em8 game is completely automatic. The five community cards are dealt and a player’s best five-card hand is determined. Unlike most poker-based table games at casinos, there is no minimum hand strength needed to win and no dealer hand to beat. In the case of Pick’em8, the winners are the players with the strongest hand, period. The prize pool is then divided equally among all of those players who share the strongest hand. This would imply that every player is given the same eight possible hole cards, which makes sense, as it means that everyone has a chance to win if they choose wisely. Nobody is an automatic loser. Buy-ins for Pick’em8 – at least at the outset – will be $0.25 or $1. The buy-ins from every player competing in the current round will be put into the prize pool, which, as mentioned, will then be split among all the players who end up with the strongest hand. By the looks of the screen captures that 888 has loaded and ready to go, the rake seems a bit steep. In the example game, there is one player who bought in for $1, but the prize pool is just $0.91. Thus, playing by oneself would be a terrible idea; I’m curious if the pre-game wait time will be to make sure a certain minimum number of players join to reduce the chances of the winners earning less money than their buy-in. 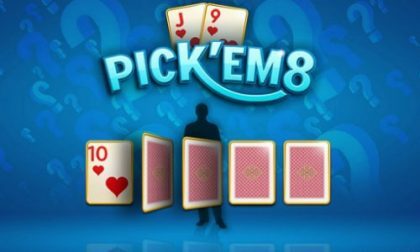 At first glance – obviously without actually trying the game yet – it seems like Pick’em8 could be an entertaining way to pass a little time. And if the stakes stay that low, that time could be passed on the cheap. It’s obviously a game that is dominated by luck, as you never know what community cards will be dealt. You could choose the best two hole cards and still lose ten straight games. Really, it’s basically just the equivalent of an all-in shootout; everybody is blindly all-in. Some decision making is still there, as I probably wouldn’t select deuce-seven offsuit as my hole cards, but after the sliver of skill used at the outset, the game is all luck. *Just kidding. My parents don’t read my stupid crap.